When collecting spiders' egg sacs (in the hope of rearing parasitic Hymenoptera from them) I normally enclose the sac or nest and any attending female in a corked 3" x 1" glass tube. If necessary the nest is opened at the time of collection enough to inspect the contents and, if parasitism is not evident, it is opened again about 7-10 days later, by which time overlooked parasitoid eggs should have hatched and become visible as actively feeding larvae. This procedure was followed for a slightly marked egg mass in an inhabited and apparently intact nest of Clubiona reclusa O. P.-Cambridge constructed from a leaf of cowslip, Primula veris L., collected near Witherslack, Cumbria on 17th July 1988. At the second inspection approximately half of the eggs present and intact when collected were seen to have been consumed, apparently by the female spider. The mass had been laid waste from one side and local destruction of eggs was complete. The possibility that an overlooked predator had later been eaten by the spider seems remote given the close examination made at the time of collection, and the mechanical damage inflicted on the eggs was not compatible with parasitism alone. Ovivory by certain spiders clearly plays a regular part in their nutritional ecology in ways discussed by several authors. For example, some spiders eat the eggs of conspecifics (Jackson, 1988), spiderlings of various groups eat infertile eggs from their own brood (Downes, 1988 and references therein), and the brooding females of an Australian pholcid have been reported to eat small numbers of their own eggs progressively (Downes, 1987). But why this particular female, unlike the many other C. reclusa that I have kept under similar conditions, chose to devour her own eggs was not clear: normally even if the whole batch proves inviable the eggs have not been damaged in any way, nor have larvae of the regular hymenopterous parasitoid Cells rufiger (Thomson) (Ichneumonidae: Phygadeuontinae). It may, nevertheless, have been a response to speculative parasitism by a less adapted parasitoid species, in which case such behaviour would help to explain an evolutionarily significant step towards parasitism of mobile spiders that appears to have taken place in the ichneumonid subfamily Pimplinae in the exploitation of clubionid hosts. 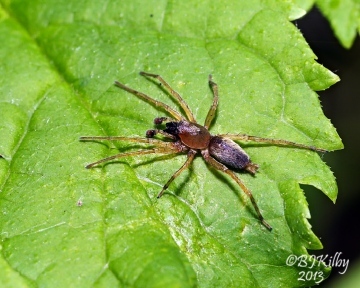 In this subfamily, genera such as Tromatobia oviposit and develop in quite a wide range of spiders' egg sacs, whether or not they are guarded, without harming the adult spider. Tromatobia species are not, however, reared from clubionid nests: their place is taken by another genus, Zaglyptus, that is presumed to be more derived. Zaglyptus species differ in stinging the guarding female spider to death at the time of ovipositing, and the resulting larvae consume the corpse as well as the eggs. Attack on, and consumption of, the adult spider is well on the way towards the biology of the tribe Polysphinctini, whose hosts are mobile spiders which have been only temporarily paralysed to allow an egg to be affixed, and it is probably significant that some of the most primitive polysphinctine genera (e.g. Dreisbachia and Schizopyga) are associated with clubionids (see Fitton et al, 1988, for further details). Further (more careful!) observations on the circumstances in which clubionids will eat their own eggs, or anything else in their nests, would therefore be of particular interest. I thank Isobel Baldwin for confirming the identity of the female C. reclusa. Downes, M. F. (1987) Crossopriza (lyoni ?) (Araneae, Pholcidae) eats her own eggs. J. Arachnol. 15: 276. Downes, M. F. (1988) The production and use of inviable eggs by Theridion rufipes Lucas (Araneae: Theridiidae). In Austin, A.D. & Heather, N. W. (eds). Australian Arachnology. Miscellaneous Publication No. 5, Australian Entomological Society, Brisbane. Fitton, M. G., Shaw, M. R. & Gauld 1. D. (1988) Pimpline ichneumonflies: Hymenoptera, Ichneumonidae (Pimplinae). Handbooks for the Identification of British Insects 7(1). Royal Entomological Society of London. Jackson, R. R. (1988) The biology of Jacksonoides queenslandica, a jumping spider (Araneae: Salticidae) from Queensland: Intraspecific interactions, web-invasion, predators, and prey. N.Z. Jl Zool. 15: 1-37. Added by John Partridge at 19:29 on Tue 10th Jan 2012. However Bristowe (1958), describes many of the habits of C. reclusa, and remarks that the retreat is usually constructed of " . . . broadleaf of Bramble or other plant' While working on some aspects of crop colonisation by spiders during the summer, (1981), I collected several specimens of C. reclusa. Of sixteen individuals captured, two were in pitfall traps and the rest were taken from their silken retreats. Without exception this was constructed in the curled leaves of Rumex obtusifolias L., the Broad Leaved Dock. Although there were several plants in the study area with broad, pliable leaves, including a large bramble bush, there was no sign of the characteristic retreat in any of them. It appears that this is an example of plant preference previously unrecorded in this species, and it raises a number of intriguing questions over host plant selection and location. That mechanisms of this kind are operating seems likely as a single C. reclusa was found in a lone dock plant some 10 yards into the crop, (of spring wheat). It seems very unlikely that the spider could have located the plant by wandering randomly through the wheat. It would not be difficult to test these ideas experimentally, and I hope to make further observations next year. If anybody has recorded plant species when collecting C. reclusa I would be glad to hear from them. Bristowe, W. S. 1958. The World of Spiders. Collins, New Naturalist. Keeble-Martin, W. 1965. The Concise British Flora in Colour. Ebury Press and Michael Joseph. Locket, G. H. and Millidge, A. F. (1951). British Spiders. I. Ray Society, London. Pickard-Cambridge, O. (1879). The Spiders of Dorset. Sherborne.